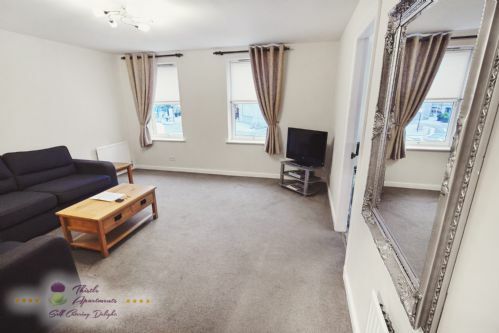 This beautifully furnished first floor apartment is located in heart of Aberdeen within secure apartment complex. 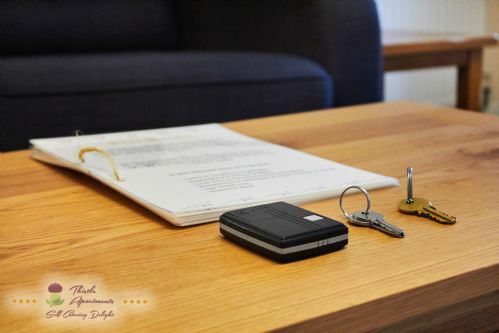 Location is quiet and each apartment has it’s own allocated parking space. 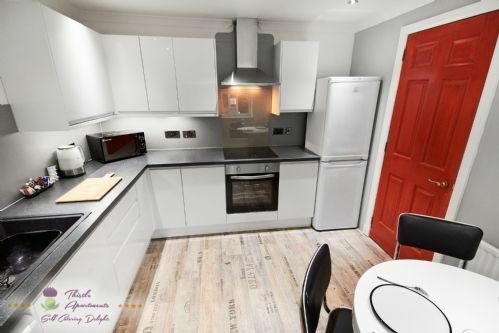 This 2 bedroom property is located within 2 minutes walk to main high street and surrounded by places of interest, restaurants and shopping centres. 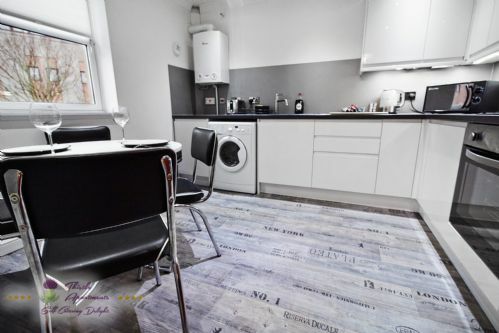 Marischal Square Deluxe Apartment features comfortable lounge and sitting room, dining kitchen with hard wood oak flooring and washer/dryer. Spacious bedrooms offer comfort with each room fitted with TV. Upper floors are only accessible by the stairs. 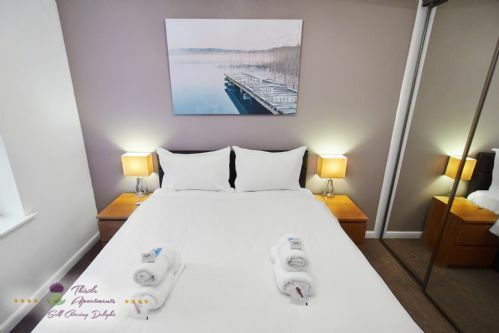 Please choose your beds: (2 King size), (1 King Size and 2 Single) or (4 Single Beds). Very functional place to stay. Very functional place to stay, great location, washer in place. We enjoyed our stay. Were able to fix breakfast and tea in the morning just fine. Walkable to downtown and the marina as well. Parking space included was a real benefit. 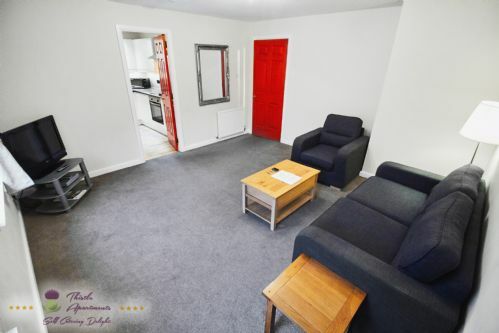 Nice located apartment in the centre of Aberdeen. Nice located apartment in the centre of Aberdeen, service was outstanding, but cleanliness of the apartment was indeed poor and dirty!!!! There were dusty, especially the bathroom and the kitchen draws. Our Thistle apartment was the perfect spot to spend over a week with our daughter who is studying at the University of Aberdeen. Its proximity to the University, Morrison's grocery, Union Station and the city center couldn't have been better. Communication with the host was excellent and a late check out was easy to arrange. Our only suggestion would be more written directions for how to use the stove and washer/dryer - being from a different part of the world, appliances work differently too but between google and a handy husband, we figured them out. We would highly recommend Thistle apartments to anyone else needing to be close to the university and the city center. 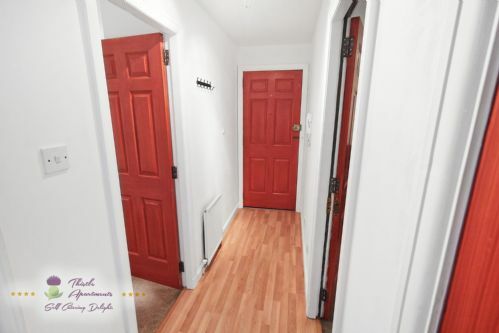 The apartment is immaculately clean, quiet and conveniently located. 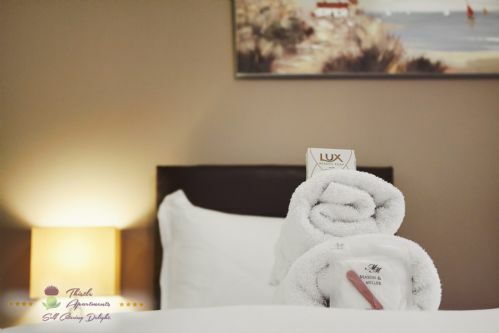 Towels and toiletries were supplied, and the bed was comfortable. Staff was very responsive and helpful. I would describe the decor as "functional." It's easy to walk most places around Aberdeen from the apartment, and there are a Sainsbury Local and M & S Foodhall quite close by. Lovely apartment within easy walking distance of shops and eateries. A bonus is the parking and the accommodation was clean and spacious. Would definitely book again. We had a great stay, and the guy who met us was so helpful and lovely. Would definatly be back! Although the kids thought the wifi was a little slow , otherwise perfect place. Great location for city centre access and shopping. We had asked for two parking spaces as we were travelling from different parts of the country. We were told there could only be one space provided per car. The beds were comfortable, but on the small side for anyone over 5.6. Dish cleaning sponges were provided but were well used. As they are a really cheap item to buy, perhaps one new one would be better than 2 old well used ones. If not new ones, then better with none at all. 눇The apartment was a good size and simply, but effectively furnished. The location could not have been better. 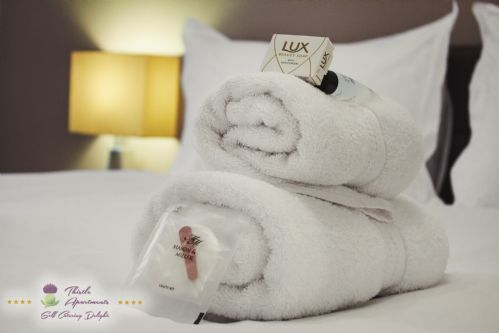 Towels and toiletries provided were a bonus, but for longer than one night (3 nights in our case) we could have done with a few extra towels. All was clean. Welcome pack of tea and coffee was appreciated. El apartamento es muy confortable, muy limpio, bien situado en la ciudad y sin ruidos. La atención ha sido muy correcta. In our case, the photos matched the apartment (because they don't always). We weren't sure what time we'd arrive because of a long drive but our host was there to meet us and the flat didn't disappoint. It was spacious, clean and had everything we needed. It was good to have free parking right outside in its own gated complex. Inside the flat was not overly cluttered with the kitchen having all the mod cons that you would need. You could get to most of the town within 10 minutes walk. 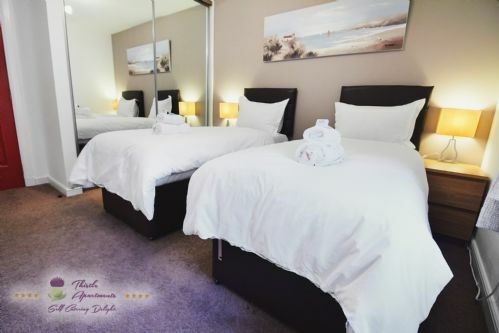 We found the description of the property confusing when it came to describing the bedrooms, but we had a double and a twin which suited our requirements. Maybe they have different configurations available. 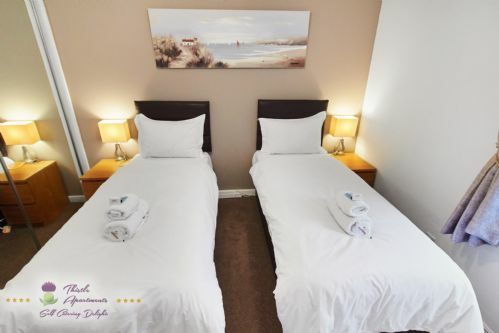 When you compare to the costs of 2 rooms in a hotel then this is good value. 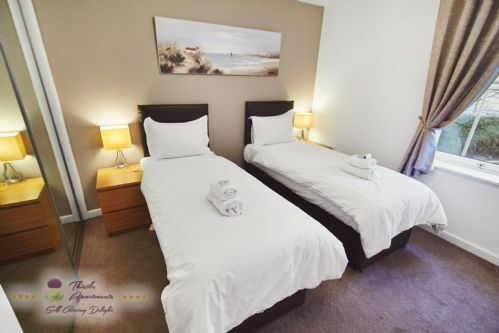 I am very happy and satisfied from my stay Thistle Apartments Aberdeen. It was great experience. 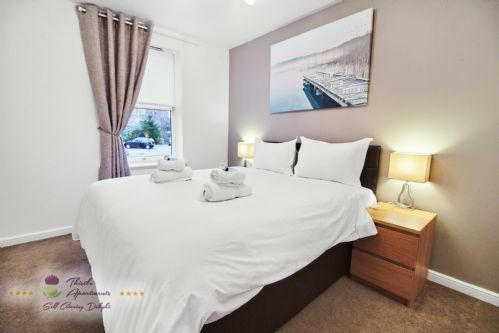 I would recommend this property to anyone who is planning to visit Aberdeen. Location was excellent. Property was clean and the customer service very friendly and helpful. It is home away from home. no complains at all.Good value for the money. This apartment was perfect and had everything one could need. My only regret: I wish I stayed longer! Perfect location! Very comfortable, spacious, clean and 'at home feeling'. The host was very helpful and I will certainly return on my next trip to Aberdeen! Great quiet central location and everything within walking distance. The apartment is in excellent condition, we were very comfortable for the week. Location is perfect. Aberdeen's center is a 5 minute walk. Also a big Morrison supermarket is nearby (5 min walk). Apartment also has a free parking place. Excellent location. Walk through the city. Pubs and vinyl stores. 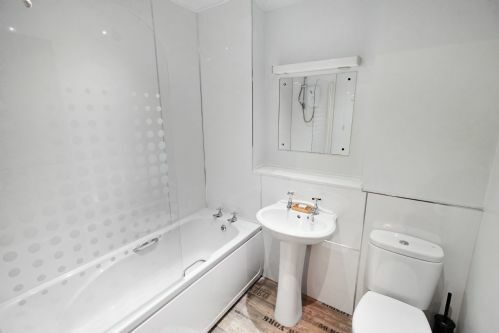 Newly renovated flat. Large contemporary kitchen. Clean. Fast internet. Attentive customer service. We will stay again when we return to Aberdeen.